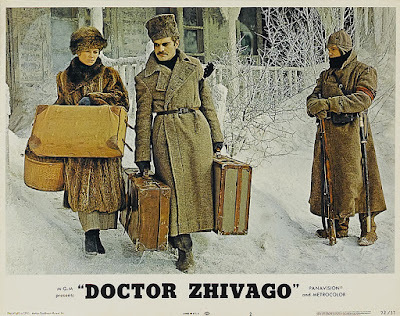 Today, I'm participating in The Movies That Haven't Aged Well blogathon with a post about Doctor Zhivago (1965) starring Julie Christie and Omar Sharif (center). This event is hosted by MovieMovieBlogBlog. Doctor Zhivago was a huge hit when it was released in December 1965. 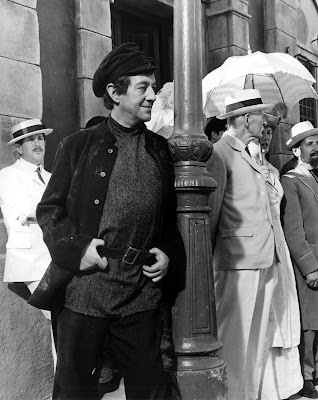 Audiences flocked to cinemas for director David Lean's sweeping epic of the Russian Revolution starring Omar Sharif and Julie Christie as star-crossed lovers. The film not only lit up the box office; it became a sixties cultural touchstone. 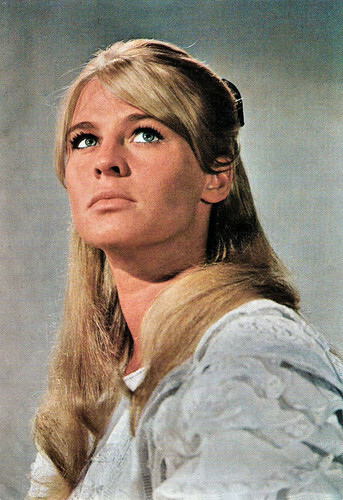 Women copied Christie's clothes and hairstyle and Doctor Zhivago's balalaika fueled score became a smash hit. The movie is still popular today. Doctor Zhivago was No. 39 on the American Film Institute's list of 100 greatest movies and it climbed all the way to No. 7 on AFI's list of 100 greatest love stories. There's still a lot to like about Doctor Zhivago. Lean and cinematographer Freddie Young provide many stunning visuals, and there are quite a few good performances. Rod Steiger, who plays a depraved bureaucrat, is on a method acting planet all his own, and Christie is quietly effective as the beautiful, but damaged Lara, but Tom Courtenay, as a young idealist turned brutal revolutionary, gives the movies's standout performance. Julie Christie in a beautiful postcard for Doctor Zhivago (1965). 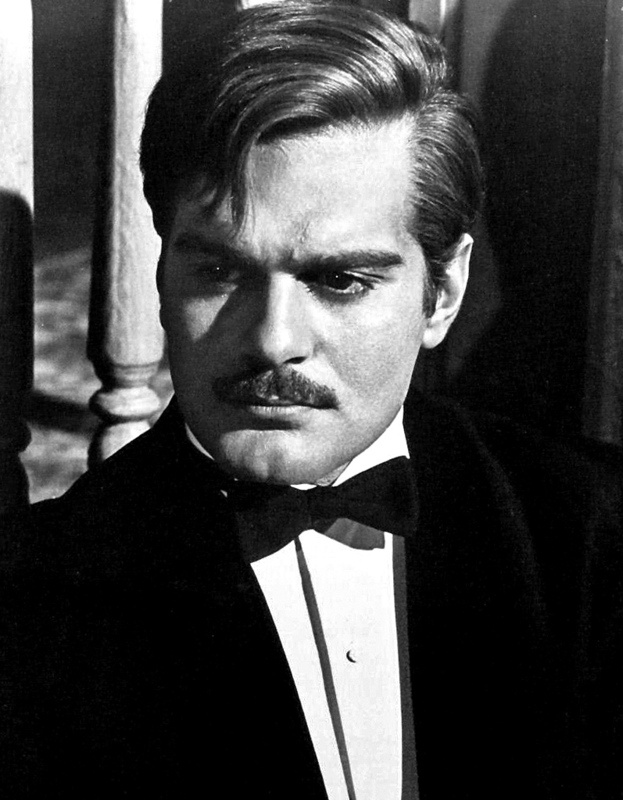 It's overrated: Lean made many great movies, but Doctor Zhivago, isn't one of them. I wish he was more celebrated for his better works like Oliver Twist (1948), Summertime (1955), and The Bridge on the River Kwai (1957). Omar Sharif as the title character in Doctor Zhivago (1965). It's long: It's not just that it's long, it's that it really doesn't need to be as long as it is. Lean could have cut at least 20 minutes from this 3 hour plus movie by tightening up long meandering scenes of (and I'm not joking about this) people just walking around. The film's opening scene is a good example. There are lots of pointless shots of women walking across a dam before Lean finally gets to the action: Yevgraf Zhivago (Alec Guinness) is looking for his half-brother's child. The main character is boring: Yuri Zhivago is the movie equivalent of watching paint dry; however, I do think the criticism of Sharif's casting is misplaced because Yuri isn't very exciting in the novel. Sharif does the best he can with an extremely bland leading role whose only interesting character trait is that he seems exceptionally squeamish for a doctor. It's a waste of Alec Guinness: Guinness is one of the great film actors of the 20th century; in fact, he turned in some of his best performances in Lean movies like Great Expectations (1947) and The Bridge on the River Kwai. However, he is completely miscast in Doctor Zhivago. There are many other roles he could have played in this movie (he could have taken both Ralph Richardson's and Steiger's roles with ease), but it defies belief that he and Sharif could be brothers, even if the movie keeps insisting that they are only "half-brothers." Plus, for part of the movie he has to wear a ridiculous costume and wig that makes him look like a middle-aged member of The Monkees. Alec Guinness in one of his ridiculous costumes from Doctor Zhivago (1965). The Music: Even if you've never seen a minute of Doctor Zhivago, chances are you're familiar with the jangly strains of "Lara's Theme" aka "Somewhere My Love." Maurice Jarre wrote a fine Oscar-winning score, but Lean overused a small portion that is based on traditional Russian folk music. I think Lean was going for a The Third Man vibe; that movie's zither score was widely praised for bringing an authentic Viennese feel to the Cold War thriller. Instead, Lean created one of the worst ear worms of all time, destined to show up on every collection of Time-Life lush romantic ballads from here to eternity (Andy Williams belts it out in the clip below). Doctor Zhivago is available on DVD and video on demand. Also, if you have DirecTV, you can stream it for free. Lovely critique! I confess I haven't seen this movie, though I've heard about it for years, but based on your commentary, it does indeed sound overblown. (Somebody is going to flame me online for saying that, I know, but oh well.) Anyway, thanks so much for contributing such a lively entry and for participating in my blogathon! Thanks for hosting the blogathon. I had a lot of fun writing an article from a different perspective. Doctor Zhivago is one of those movies like Titanic that's extremely popular, but,for me, I think it's just OK. I agree that the movie hasn't aged well. One huge annoyance is the use of 1965 female hairstyles in a film set in the early 1900s. Its so obvious that it hurts. Tightening Zhivago would destroy the very thing that makes it great. But hey, we like different things in movies. I basically disagree with you on every point except the one about Yuri being a bland character. Last time i watched Zhivago, I actually thought it felt shorter than I remembered. It's a work of art and so beutiful that you could take stills from it and frame them. When Beethoven's Ninth Symphony premiered in Vienna in 1824, one newspaper reporter criticized it, saying that it sounded like a train, shrieking through a tunnel.